it’s a homebuilt loop antenna, the antenna loop is made using a cheap “hula hoop” then, a handful of cheap components allow to have a remotely controlled tunable circuit which also acts as a (low gain) preamplifier and impedance matching. It’s not a bad design, if a little finicky. Since the TL592 is basically a video voltage op-amp it tends to be a bit noisy at HF frequencies compared to a discrete design, but it’s better than many. The output resistor should really be more like 20? to match 50? cable & receiver (the TL592 o/p impedance is 30?). To get the best out of it, it also needs to be run either from batteries or a _very_ well-filtered supply – ideally, in either case, with better filtering at the antenna/amp end. From memory, I added a pi filter with a 1mH choke & (100?F bypassed with 0.1uF ceramics) on either side. I toyed with the idea adding a pi filter to the tuning line too, since in my location I suffer from both AM & FM break-in to anything broadband, but in the end I had no trouble with it. As mentioned in the article, the resistor across the input is needed to give some practical bandwidth – it really is razor-sharp without it, to the point that at the bottom end it can be so touchy to be near-unusable. 4.7k made it a bit broad for my liking though; I ended up with I think 10k? there which, in conjunction with a multi-turn pot, made it sharp-ish but with nice gentle tuning at the bottom end . I tend to prefer Trask-style loops these days – either tuned, or untuned with a bit of amplification – but that design is a pretty good beginner active loop. As a Ham, I use a vertical pole when I was in college for 40 and 80. What I did, following a magazine article, was cover it with a variety of artificial flowers and a stand looking like a flower pot except it held cement. The coil was also covered. The patio excepted the decorative tree and blended in with the surroundings quite well. I live in a two story brick apartment up stairs. I use a I Max 1000 outside antenna suspended from the celling. Great reception in evening time. Run a Kenwood R 1000 receiver. I have owned a W6LVP loop, a Wellbrook loop and a Doxytronics loop. For the price paid vs what you get, get a Doxt loop… nearly 1/3rd the price of a wellbrook and about 1/2 the price of the W6LVP. The doxy has sharper nulls then the other two and the antenna tuner knob built into the Doxy makes a difference. The antenna is labeled as tuning 3-15mhz, while it won’t go lower very well.. I regularly used it to hear Radio Kuwait 15540khz when they were analog and had no issues. Some of those loops are so damn ugly that neighbor complaints are inevitable. Some visual re-design will make them less obtrusive and noticeable. Otherwise you’ll get complaints about having shop-vac attachments on sticks on your deck from the busybodies. I live on the first floor of a six floor cement multiple dwelling in Athens, Greece. 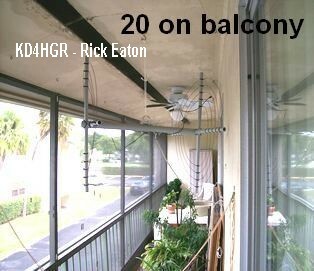 I use either an indoor or an outdoor random wire stretched along the bottom of the balcony above me. Using different transistor radios I saw minimal improvement and only on SW with the outdoor wire but one tube radio had worse reception below the 25m band with the outdoor wire. MW reception was clearly better with the outdoor wire but only on certain tube radios. The reason for the minimal improvement on SW is probably due to the fact that I am surrounded by tall cement buildings. I thought about a loop antenna but that would be an exercise in frustration. The reason is that I have been having different noises, most of the time simultaneously, some of variable period, intensity and frequency and all of outside sources, a situation that at least would require constant tuning and reposition of the loop. A single RFI filter certainly will not suffice. And here is a strange case of laptop noise: I had both my laptop and one of my tube radios connected to to the same electrical outlet via the same extension with no problem. I started using a surge suppressor with a built in RFI filter to connect both to the outlet and the laptop interference has made it impossible to listen to the radio. I replaced the suppressor with a different brand but the noise is still there. The mystery and intrigue that come with radios has enchanted me since my kid years! Another inexpensive antenna option is a dipole with the feedline running up the wall in a corner, and then the dipole arms going out along the top of ceiling at a 45 degree angle – sort of like an X,Y,Z axis turned upside down. 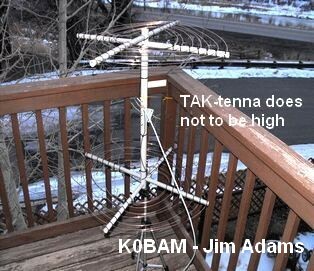 This is even useful as a transmit antenna with low power, but should be quite good for reception. You might have to experiment with different locations in the apartment as there may be more or less electrical wiring nearby, but you should be able to find a reasonable spot. One additional note, since duct tape or electrical tape along the walls might not look so neat (! ), to hold up the wire along the ceiling you might want to invest in the adhesive hooks sold everywhere which allow you to remove them without damaging paint – they will look much nicer, be more than sufficient to hold the wire, and won’t damage the walls. Thanks, Robert–great suggestion! I love the idea about the removable hooks. Duct tape is brilliant stuff, by by golly removing it later might remove part of the wall or ceiling! Another thought I’ve had–and have seen done in the past–is using adhesive copper tape on a large window like a sliding glass door. I have four PK loops and enjoy them all. They are shielded loops [I believe] and better at rejecting room RFI than my non shielded loops. Mine do have to be tuned to frequency, but one type of PK I do not have is matched for all of MW and available with a co-ax lead with or without an amp. With a remote untuned loop, you could scan the band, and then point the antenna differently and scan again. 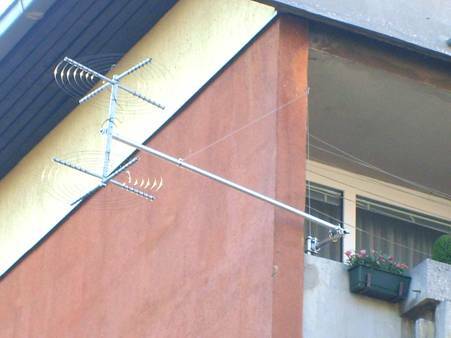 PK offers at least one remotely tuned AM loop you could clamp to a balcony railing or position just inside a large window. PK Loops are great. I’ve been considering investing in one of his larger MW loops. I could probably build one, but I like supporting folks that make quality products in our radio world.